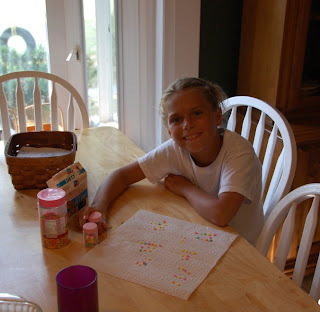 today was lizzy's first official day of homeschooling. yesterday we had a meeting with matt's teacher so we visited josh at lunch. many of the girls begged me to let lizzy come back to school and keep josh home because he's annoying! :) she was really happy to see her friends again. but she had a good first day today and had more fun than she thought she would. yesterday she was grilling me with silly questions about a bird in the yard, so today she interviewed said bird and wrote its life story in her journal (complete with names, its family tree, former jobs, very creative). she also helped at the store by using the calculator to add or multiply prices. her second day was fun too. 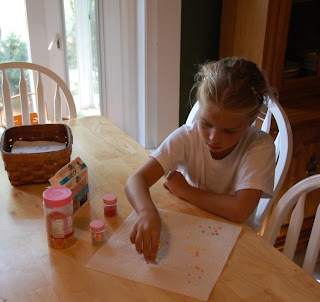 in the picture, she was working on her multiplication tables with sprinkles before she decorated the cupcakes (during which we worked on reading, adding fractions, measuring ingredients). side note, we have 45 trees in our one acre yard. that seems like a lot. i've always wondered and lizzy needed to review counting with tally marks, so there you go. i wanna go to the lundy school!!! Looks like learning is FUN there!! !